The most common reason for skin disease in the dog and cat is flea bite dermatitis. The reason for this is the saliva the flea injects under the skin when it is feeding. The saliva can be very irritant like a midge bite to us and as some people are more irritated by midge bites so is the same for cats and dogs. With the irritation the cat will lick and groom itself more frequently leading to loss of fur ( baldness) or broken hairs which can be felt over the back or it will lick its lips and so produce sores around the mouth or scratch itself leading to scabs on the back (miliary eczema) or scabs around the face and neck. 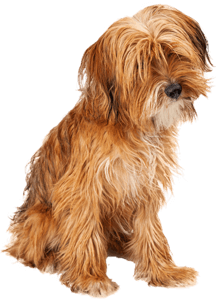 For the dog nibbling at the coat or scratching leads to damage to the skin resulting in further problems with overgrowth of bacteria or yeast on the skin and the typical doggy smell. Just killing the adult fleas on your pet will only be a temporary solution as the source of the fleas is in the environment. Household sprays are good but will not act against pupae only against eggs larvae and adult fleas(for 2 weeks only). Care must be taken in their use as they are toxic to fish and birds. We recommend products that stop further egg production and rapid death of the adult flea to minimise the number of flea bites and so exposure to flea saliva. This can be sprays, spot ons, tablets or collars and a discussion needs to be had as to which is the most appropriate treatment for you and your pet.